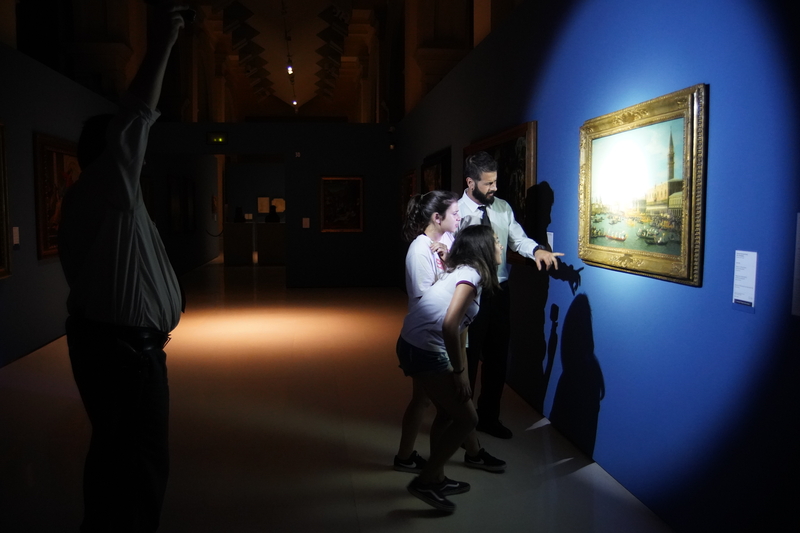 In a previous article we explained the night which the boys and girls from the Institut Juan Manuel Zafra from the neighbourhood of Clot of Barcelona spent in the museum. It formed part of the artistic research that they had done in the museum during the course, within the framework of In Residence. As the result of their research, you can visit in the educArt space of the museum From six to six. Now we share with you the impressions of the boys and girls in the end part of the project. 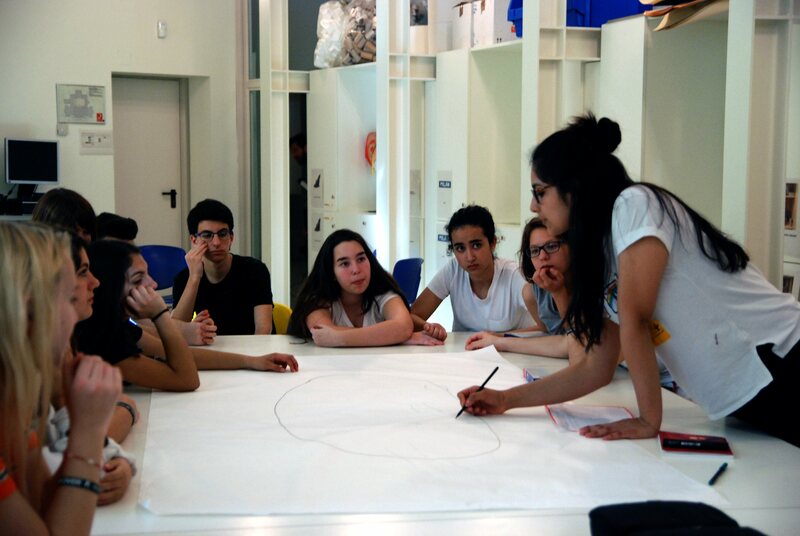 In a last session in the institute we had a conversation with the students, the teacher and the artist Mariona Moncunill to assess how the presentation of their project and the subject in general had gone. 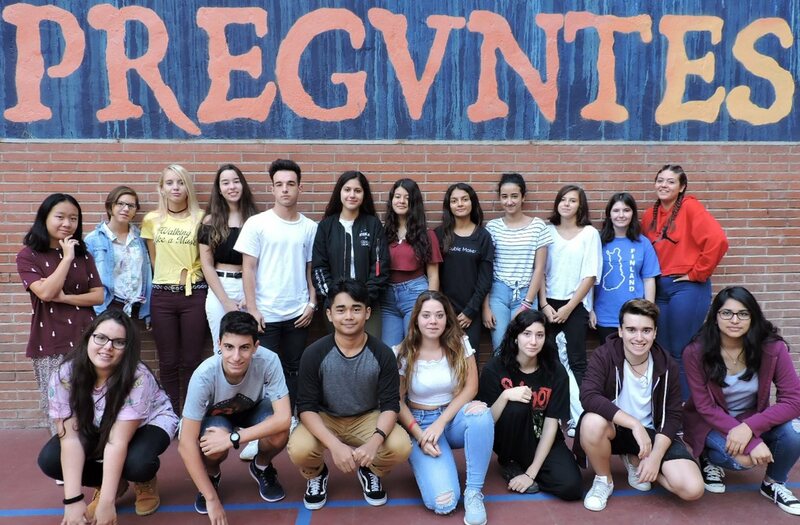 It was very interesting, and towards the end of the session, we remembered that the first photograph that was taken with the group was framed with the word “preguntes” (Questions) which appeared on a wall of the playground of their institute and it seemed to us that it was a premonitory image of the residence and summed up the project and the attitude of the group very well. As a subject has it surprised you? It has been much more dynamic than other subjects. Mariona: The difference is that when you form part of a process and you yourself are the process, you are inside it, you see all the decisions that are taken, why they are being taken, everything has a different sense. In fact, this is one of the problems we have in the world of art, sometimes you do a project and many people don’t understand it, and maybe they think it is something silly because they don’t see this process which is so long. Sometimes you try to explain it so that the others can understand. … What is important is to know that when somebody does something that seems absurd to you, many times it is because you don’t understand that for the other person it is important and what the process has been to do it. What vision will the people who enter the educart space of your project have? Are you now more sensitive to art? Are you now more open to seeing an exhibition? How was the experience of the public presentation of the project? Presenting the exhibition in the museum with the public was a very good experience. We had done presentations to the Institute but it’s not the same, said Clara García. Sandra Gimeno said that in the presentation it became apparent that you were highly involved in the project, you knew what you were talking about. The difference, Aisha Gutiérrez explained, was that “we had done the project, we hadn’t been given a topic as happened with other expositions in the school. It was something of our own, and therefore we were even more nervous”. With all the ideas that have emerged and that perhaps were those that each of you didn’t like most, do you feel represented by the project? Aisha: Yes, because in the end it is like a combination of all the ideas that we have had because before starting to do the work in the museum we made some lists and we reached an agreement as to who would carry them out. Negotiation was very important. How did you divide up the night’s tasks, of the three actions you carried out? We divided up the tasks according to the likes of each one. Mahe added that the idea of the three interventions (Sala oval, the night rounds and the audios in the rooms) so that in this way each of us could choose what we wanted. We also negotiated if we would only do the action in the Sala Oval or other actions. In the end, we opted to do three, and Mariona explained that in this way the complexity of all the research that they had carried out was reflected better, even though she was afraid that it might be too much, and that they had to do everything on just one night, but it all turned out very well. What would you highlight of that night? When you returned home what stuck in your mind? Do you want to highlight anything? What vision do you have of an artist now? Elena said “I thought that an artist did something nice and that’s all, but I didn’t give so much importance to the creative process and to the significance, that they were more interested in the desire to exhibit something, the result more than the process, and now I have seen that it’s not the case, that art can be the process of creation. I would now consider art as everything we have seen, what we have created together”. We all applauded this intervention. Sandra and Mariona highlighted the capacity of negotiation and dialogue that the group had, and the fact that agreements were always reached, and all the opinions respected. Mahe stressed the cohesion that the group had – that they had understood each other very well. It flowed very well, because you have worked to make it so, the process wasn’t always easy. For example, proposing to spend a night in the museum, it wasn’t so clear that we would be able to do so until we had a specific proposal and we could end up defending it. Things also emerged because they ended up trusting you, sometimes. How have you experienced the uncertainty of a project like this one? A subject in which you didn’t know exactly what you would be doing? Did it make you feel uncomfortable at any time? Mariona added that she as an artist tended to be more of a controller of her projects, but with time she realised that the artistic projects that allow me to “lose control” a little, pose problems for me that would not be posed in another way…by having an idea that I want to pursue it’s like throwing a stone into the future that you have to look for afterwards and you have to solve it and you do not know how to solve it, you have a problem that you have created yourself and in the process you think you won’t do it again, but you do. Has anyone thought of continuing to do projects of these characteristics? Clara says that she feels she now has the freedom to ask, I always liked to do so very much but now even more so. Mahe says we have lit a light bulb that is different for each one. Mariona tells them that she herself at their age felt that asking maybe bothered them and now on the other hand I ask many questions and I see that people appreciate it and open up. Sandra reminds us that the first photo of the group was taken under the word “preguntes” (Questions), which have been very important. To finish, would you go to the museum again?